The Bidi Tobacco Research Station (BTRS) came in to the existence in 1947. 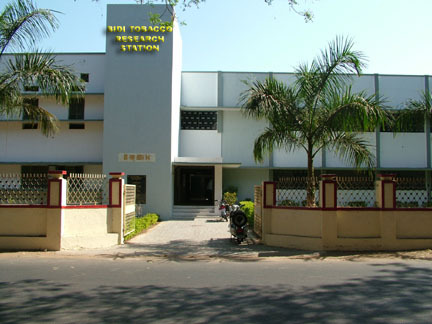 The BTRS was transferred to Institute of Agriculture, Anand in 1951. The AICRP on Tobacco- Anand Main Center was sanctioned by ICAR in 1970-71 along with headquarter (Coordinating Unit) at Anand. The BTRS and other tobacco projects at Anand were transferred to Gujarat Agricultural University in June 1972. The AICRP on Tobacco is renamed as All India Network Project on Tobacco with the headquarter at Rajahmundry under the administrative control of the Director, CTRI, Rajahmundry since Aug. 16, 1998. Tobacco Research Station, Dharmaj (District-Anand) was started in 1980 with area of 12.13 ha to conduct research on chewing (Lal and Kala chopadia) and rustica tobacco which is exported to Middle East countries. Presently, BTRS and other projects as well as Tobacco Research Station, Dharmaj are under newly formed Anand Agricultural University since May 1, 2004.